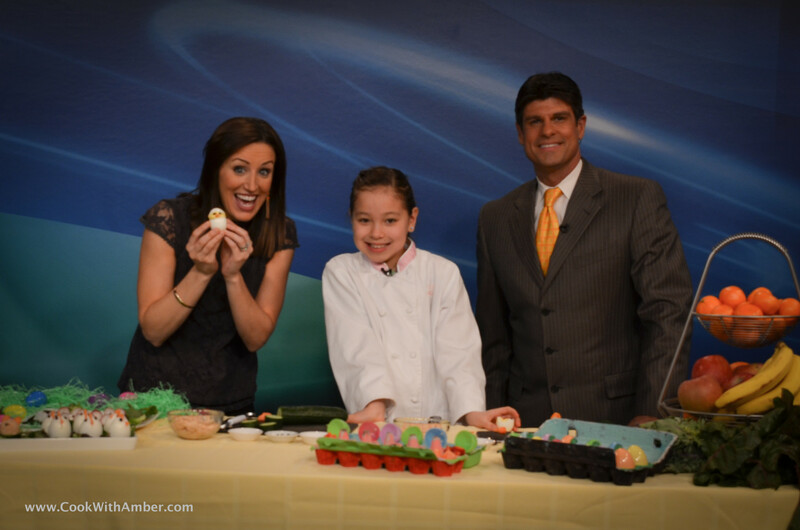 In this segment, I show some of the cute critters disguised as healthy Easter treats! To make the salmon salad, combine the salmon, lemon juice, mayo, salt and pepper and mix thoroughly. Cut a slice of cucumber about an inch thick. Scoop a bit of the center out with a melon baller. Using your hands, make a ball out of the salmon salad and place it on the indent of the cucumber slice. Place a caper on the salmon for the nose. Slice a baby carrot diagonally to create the ears, and place them in the salmon salad for the ears. Wet the tip of the toothpick and use it to pick up a single sesame seed. Place it on the bunny. Repeat for the other eye. Voila! Peel your egg and slice it in half. Take a radish and cut the little hairy root coming off its bottom. This is the tail. Slice the radishes into thin disks. These are the ears. Using a paring knife, cut tiny slits in the egg where the ears will go. 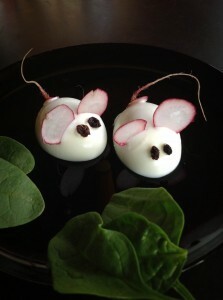 Slide the radish ears into the slits. Carefully dip one side of the currants into the mayo, and place them onto the egg to make the eyes. Do the same for the tail. Voila!